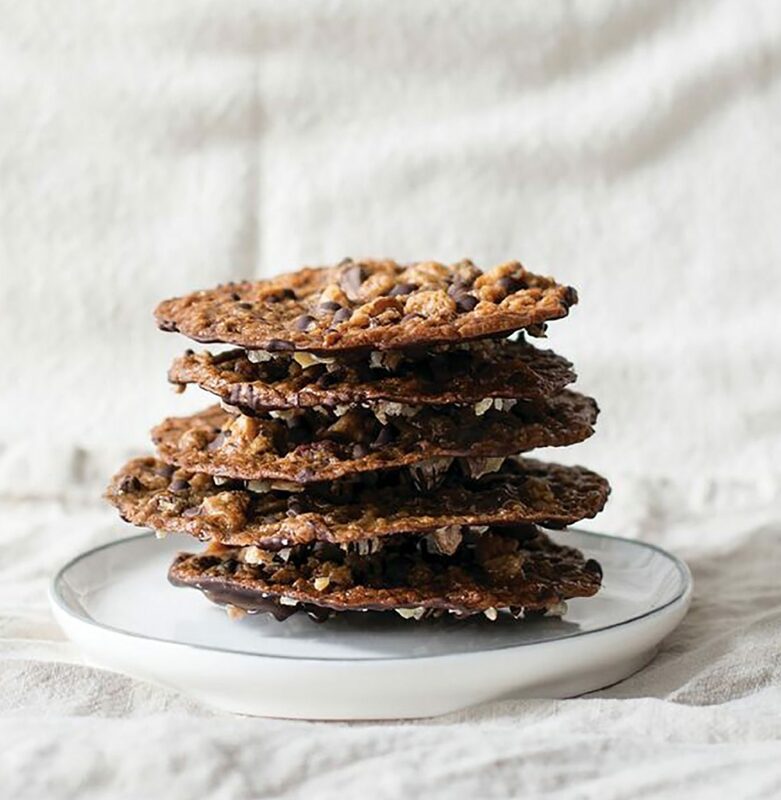 These fancy cookies by Heather Crosby of the plant-based, GF website and cookbook YumUniverse don’t require a lot of effort or ingredients and are dairy-free if you use DF chocolate. They’re also versatile: You can sub sorghum flour for brown rice flour; coconut palm sugar, Demerara, rapadura, or muscovado for Sucanat; orange zest for lemon zest; and dried cranberries or raisins for dried cherries. Bonus: these gluten free florentine cookies are just as delicious without the chocolate. MAKES 12 COOKIES Store baked cookies airtight between pieces of parchment paper in the refrigerator for up to 1 week. Preheat the oven to 350°F. Line 2 baking sheets with parchment paper or make the cookies in batches if you have only one baking sheet. Scatter the walnuts on one of the sheets and toast until aromatic, 5 to 7 minutes. Set aside. In a bowl, mix together the almond flour, brown rice flour, 3 tablespoons of the toasted walnuts, the lemon zest, dried cherries, maple syrup, Sucanat, oil, and salt. Shape the dough into 12 (3/4-inch) balls and place on the prepared baking sheets 3 to 4 inches apart (they will spread a lot). Bake just until flat and starting to brown, about 8 minutes. Slide the parchment onto the counter to let them cool and crisp. Place the chocolate in a double boiler over simmering water and melt, stirring often. When the cookies are cool and hardened, flip them, and, with a butter knife or pastry brush, spread the backsides generously with melted chocolate. Sprinkle the remaining 2 tablespoons walnuts onto the chocolate, drizzle a bit more chocolate over the walnuts, and allow to cool completely.